​We meet regularly in central London. Everyone is welcome to come along, including friends, family and interested professionals. We are a friendly bunch and simply ask all attendees to adhere to our "ground rules". Refreshments: tea, coffee and herbal tea are provided and we usually also have some nice biscuits. ​Please book your place for any of our events via the booking links below, so we can manage numbers and make sure we have enough chairs and refreshments for everyone. Contact us to let us know if you have an idea for a future speaker or meeting topic you would like us to try and arrange. To find out about further London meetings, arranged by other organisations we endorse, that may be of interest to you, click here. You can help spread the word about our events by sharing on Facebook or Twitter, or downloading, printing and displaying a poster if you have access to a noticeboard where interested people may see it. For more information or to let us know you're coming to any of our events contact us. At: the Wellcome Trust ground floor cafe on Euston Road, opposite Euston Station. Find out more on our Facebook page and please email Theresa if you plan to attend. 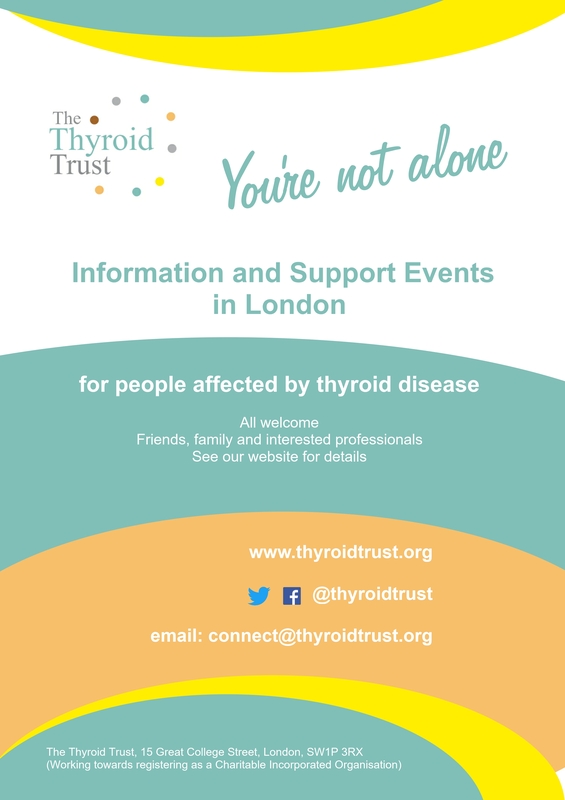 We aren't expecting lots of people but wanted to give our Thyroid Friends a chance to catch up for some informal peer support between our scheduled events. We plan to do more of these kinds of get togethers later in the year. Come and join us for an informal Learning and Growing discussion, for those interested in helping The Thyroid Trust develop our advocacy, information sharing and awareness work. To include a topline debrief on the BTA Conference which Lorraine and Judith are attending in May. Please book to attend via Eventbrite and we will notify you when the venue is confirmed. ​Margaret is Professor of Nutritional Medicine at the University of Surrey where, in 1998, she set up, and now directs, the highly respected MSc Programme in Nutritional Medicine. Her research, which includes a number of randomised controlled trials, centres on the importance of trace elements to human health. Sarah is a Lecturer in Public Health Nutrition at the University of Surrey and her research is focused on iodine deficiency in the UK. She previously held a Medical Research Council (MRC) Population Health Scientist Fellowship, which helped to develop her work on iodine. She is currently on the committee of the UK Iodine Group, and on the Scientific Advisory Board of the World Iodine Association (WIA) as well as the committee of the Nutrition Society Training Academy. This patient led group has met regularly since 2010, originally at the Royal Free Hospital in Hampstead and at Crown Court Church in Covent Garden since 2014. Speakers at our events have included many eminent British Thyroid Association endocrinologists and other medical professionals and scientists, such as from the Sense About Science, Ask for Evidence and Expert Patient programmes, all of whom have kindly given their time to help educate us about our conditions. We aim to add full details of previous meetings to this new site, for reference, in due course. You can see the reports we have uploaded so far here. ​At: Crown Court Church, Russell Street, London WC2B 5EZ. Please book your free place in advance via the above link, this will be a popular event and places are limited. Download and display a poster for this event, or share on Facebook, if you'd like to help spread the word! At: Crown Court Church, Russell Street, London WC2B 5EZ. ​This event was recorded, see the film on our Information Videos page. The talk was so popular it even developed its own hashtag on social media! #ToftTalk. Dr Toft kindly followed up with the following research references to studies mentioned in his talk and has agreed to become an Honorary Trustee of The Thyroid Trust. 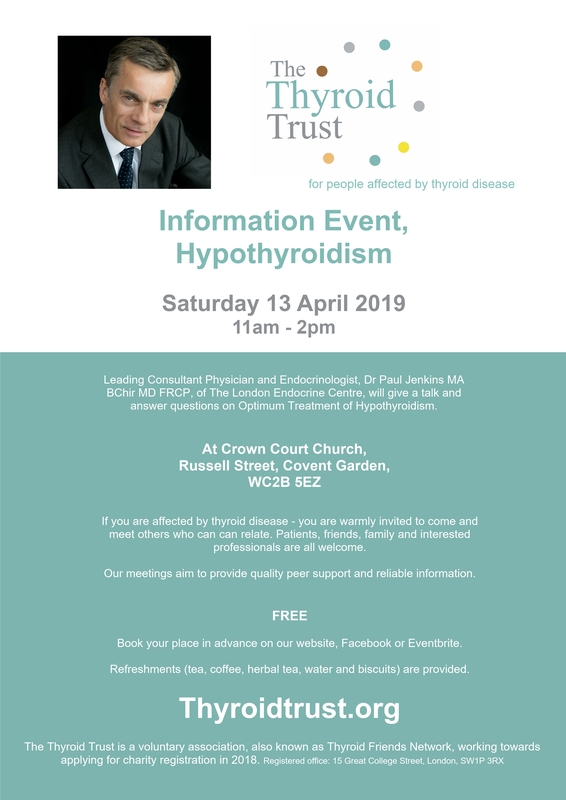 Consultant Endocrine Surgeon And Trustee of The Thyroid Trust, Mr Fausto Palazzo, gave a fascinating talk on The Evolution of Thyroid Surgery and answered questions on all aspects of thyroid disease. Our excellent friends at Mayflower Films kindly filmed the talk,watch it on our Information Videos page. Click here to see pictures from some of our previous events including our 2017 Summer Seaside Walk and 2018 Summer Social event at Sky Garden London. We held an informal get together for members and supporters based in East Kent, in the garden at Royal Albion Hotel in Broadstairs, (or indoors if it's wet or chilly), to debrief on the House of Lords debate on liothyronine and BBC South East and BBC Radio Kent coverage of the #andmeT3 project as well as to generally chat about all things thyroid. As a result of this meeting we hope to launch an East Kent group later this year as a volunteer has indicated interest in coordinating further meetings. Details on Facebook - if you would be interested in an East Kent group you can comment on the FB event, or email us. ​​Posters for this event can be downloaded here, please let us know if you would like to help distribute posters for this event. Thank you! To get more information on the programme, please click here. ​Sanjana joined the Sense about Science team as the events and public engagement coordinator in November 2017. She is responsible for delivering the events and public engagement programme, including the Voice of Young Science (VoYS) workshops and the annual John Maddox Prize evening. Prior to joining Sense about Science she worked at Cancer Research UK in a variety of roles in their Policy & Information department. She also holds a BSc in biomedical sciences from King’s College London. Storycycler, Jo Clayton, gave a talk about the mental health disturbances she experienced when very unwell with a rare thyroid condition, her journey back to wellness and the lessons she learned along the way. This event also included an opportunity to experience a nurturing guided meditation to help calm the mind in times of stress. This event was on the theme of Self Care with guest speaker Michele Varchione who has hypothyroidism and shared some gentle chair based yoga exercises we could all join in with as well as some great insights on self care and a very interesting short talk from group member and artist Peter Esslemont, about his journey with thyroid cancer. There are some photos in the gallery of this meeting! An Information Event. Professor Stephen Robinson MA MB BChir, from St Mary's Hospital in London, gave a talk on Thyroid Eye Disease. See report. 8th July 2017, 11am - 2pm, London Meeting, Patients' Voices event, Crown Court Church, Russell Street, Covent Garden, London WC2B 5EZ. See report. 3rd June 2017, we walked from Broadstairs to Ramsgate on the east Kent coast, to raise awareness of thyroid disease and have a nice day out together. See report.